The guide for anyone who dreams of living the country life in the city by growing their own healthy, sustainable fruit and veg – and more! Producing our own fruit, vegetables, herbs, eggs and honey is perfectly possible in a suburban space, and this practical guide will help urban dwellers develop a more sustainable existence. 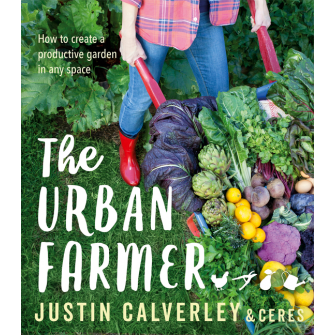 With a deep knowledge of permaculture and organic gardening, horticultural expert Justin Calverley shows you how to establish a diverse urban farm, whether in your own backyard, a courtyard or even a balcony. Justin advocates observing and following nature’s cycles and patterns as the best way to a sustainable and productive garden.As well as growing fruit and veg, The Urban Farmer explains how to take up bee-keeping, chook care, propagation, maintaining your plot and preserving your patch’s bounty. So be inspired and get cracking with your own personal garden of Eden!